BSA produced a range of motor cycles and bicycles for the British Army during WWII with one designed specifically for Airborne forces as the BSA Airborne Folding Paratroopers Bicycle (often incorrectly referred to as the ‘parabike’). Its greatest use was by British and Canadian infantry during the invasion of Normandy after D-Day in 1944 as well as in operations such as at Arnhem. 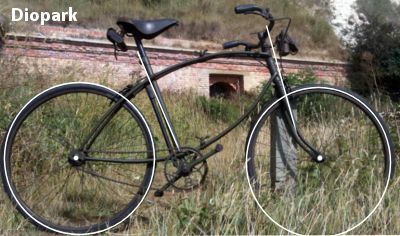 The bike was produced in two patterns, the 1st pattern in 1942 and the 2nd pattern from 1942 to 1945 with the differences between the two is very minor. The notable feature of the bike was it could be folded in half for a paratrooper to jump with them, fold out and use as a normal bicycle after landing. 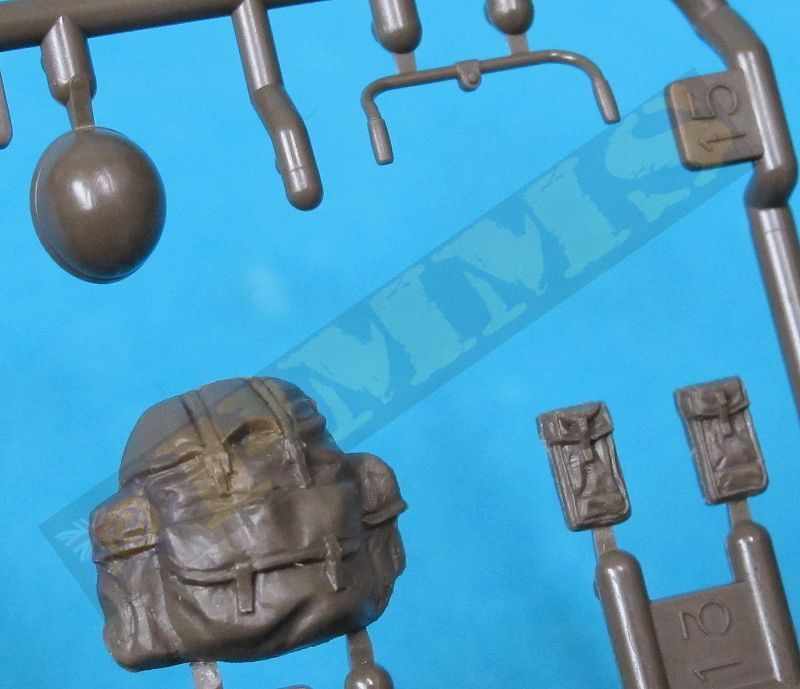 This new kit from Tamiya represents the 1942-1945 BSA Airborne Folding Paratroopers Bicycle 2nd Pattern and you get two complete bicycles and two Paratrooper figures in the kit which consists of 50 parts in olive drab plastic. That equates to just 6 parts per bicycle with an additional 3 parts to build the bicycle in the folded position plus an additional 16 parts for the two figures. It is inevitable comparisons will be made with the recent Diopark WWII British Military Bicycle (kit #DP35010) and I will do just that as part of this review and without pre-empting the conclusions, it’s like chalk and cheese but more on that below. While I don’t have the actual dimensions of the bikes I have done a small unscientific comparison as the Tamiya bike is some 4mm shorter in overall length with smaller diameter wheels than the Diopark bike. 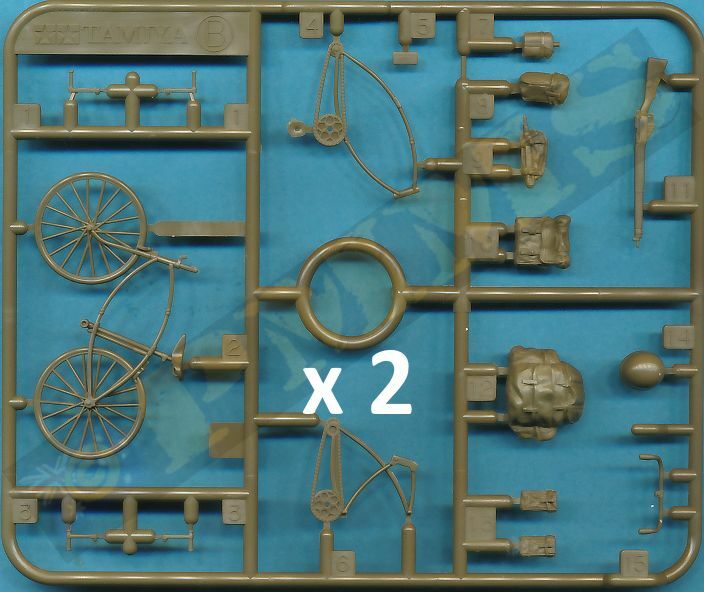 So I have taken a side on shot of the Diopark and Tamiya bikes and overlayed these to match the actual kit dimensions while also overlaying the dimensions of the Diopark bike on an image of the real bike. This shows the Diopark bike matching the real bike almost perfectly while the Tamiya bike is noticeably undersized in most dimensions. Now let me stress this is a very unscientific exercise yet the actual plastic parts match the image dimensions when compared directly even taking into account the minor perspective distortions of the image camera angles. kit dimensions showing the kit to be short by 4mm as well as the wheels being under sized in diameter. At right is the Diopark kit dimensions overlaid on the actual bike image showing this to all but spot on. distortion of the photo process, those angles are correct on the actual kits. 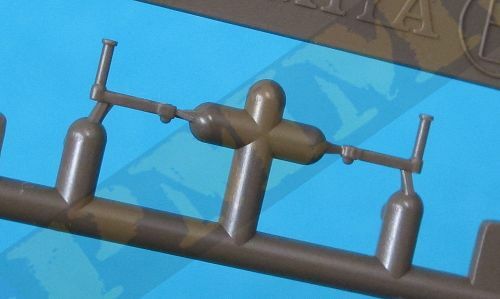 The Tamiya standard of moulding is good in regards to no flash or pin marks with just the usual mould lines and sprue burs to be removed from the parts before assembly. 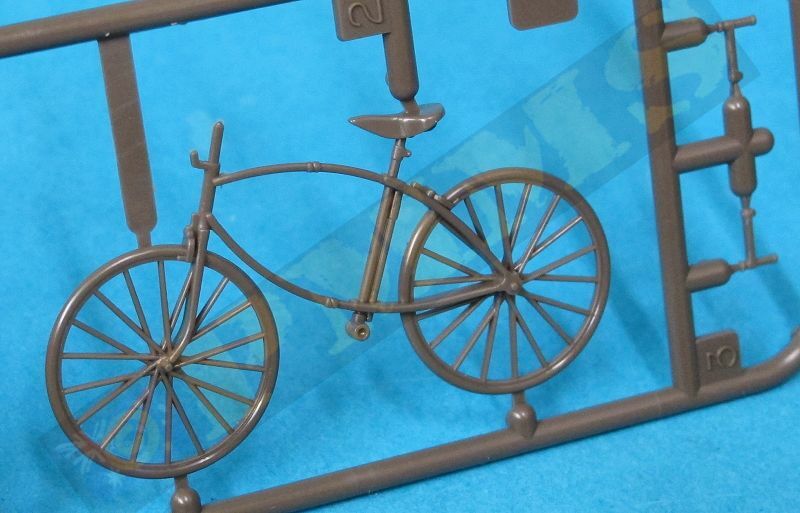 The detail on the bicycles is very basic indeed as you would expect with each bike consisting of just 6 parts compared to the 24 plastic and 13 etched parts per Diopark bicycle. With the Tamiya bike the left half of the frame is moulded integrally with the front and rear wheels which have hugely over scale plastic spokes as well the seat is included in the single moulding. The other parts include the right half of the frame with chain and pedal sprocket plus additional pedals, front handle bars and rear seat tool pack. 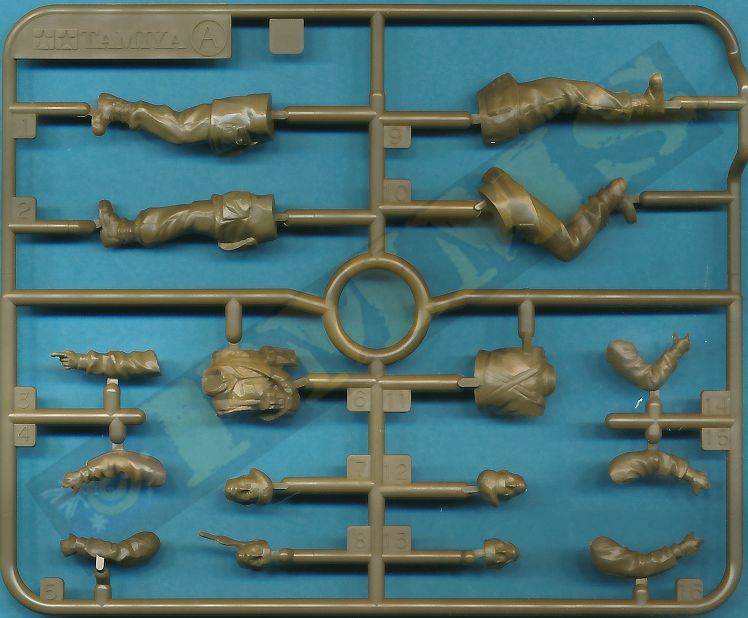 The central frames that come in the two sections are moulded quite thin for a good appearance with just the mould lines to be carefully removed, but this is where the good news ends unfortunately. 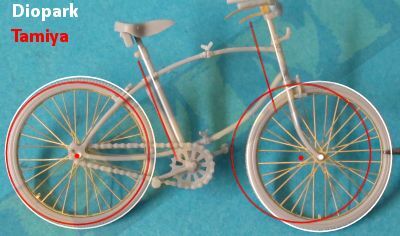 To summarise the level of detail, as mentioned the left frame and wheels are included in one single part with the thick wheel spokes but also the rear frame is moulded solid as part of the rear wheel/spokes, the front forks are moulded solid as part of the wheel and spokes. The tyres are smooth without any tread pattern, the front and rear brake callipers are moulded solid on the frames, there are no brake levels or bell on the handle bars and to build the bike in the folded configuration you have to cut the main frame in half yourself and glue in the folded position using the additional folded frame half and folded pedals provided. 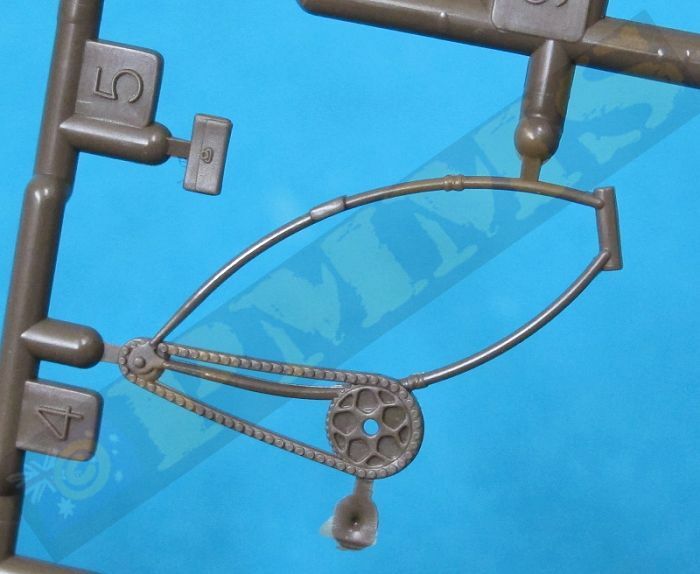 There is also the small detail with the pedal sprocket which is moulded solid in the kit, on the real bike this had the letters B S A included in the sprocket spokes but would be very difficult to replicate in plastic given the small size of the kit sprocket. 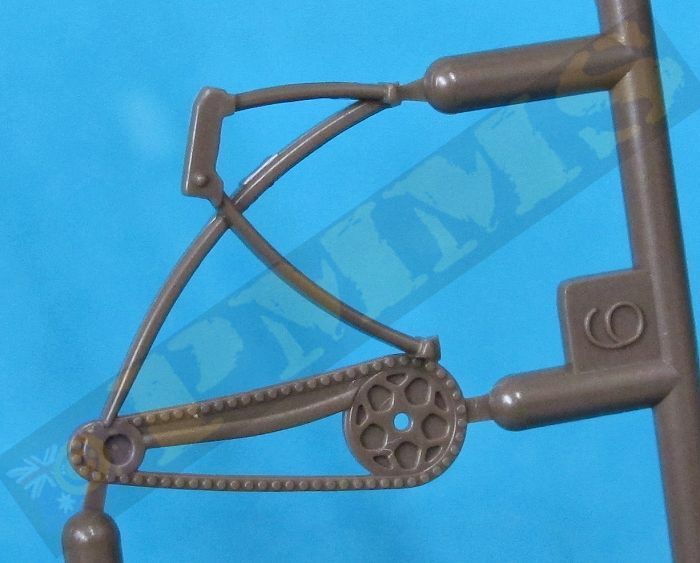 The 6 parts assemble very quickly but the level of detail compared to that on the Diopark bikes is straight out of the 1980’s and really is very basic indeed. After gluing the smaller right frame with the chain and sprocket onto the main left frame with the wheels you have the odd situation at the back where the right frame is separate from the wheels yet the left frame is moulded integrally with the wheels giving a very uneven appearance. From there you just glue the handle bars, pedals and tool kit in place to finish assembly which takes all of a few minutes for those wanting a quick and easy diorama filler. To build the bike in folded position you need to cut main left frame in half as indicated in the instructions and re-glue along with the folded frame section provided (part B6), there are also alternate inward facing pedals to use and again this should take only a few minutes to assemble. No doubt the AM people will produce etched spokes for this kit but fitting them will present another problem due to the rear frame and front forks being moulded as part of the wheels and spokes and separating these before fitting etched spokes is quite an exercise in itself. Using the two bikes proved to make one would be the best option with you cutting away the wheels on one leaving the frames and forks and the other cutting away the frames/forks leaving the wheels. But you still have the issue of no tread on the tyres which is quite an obvious oversight. 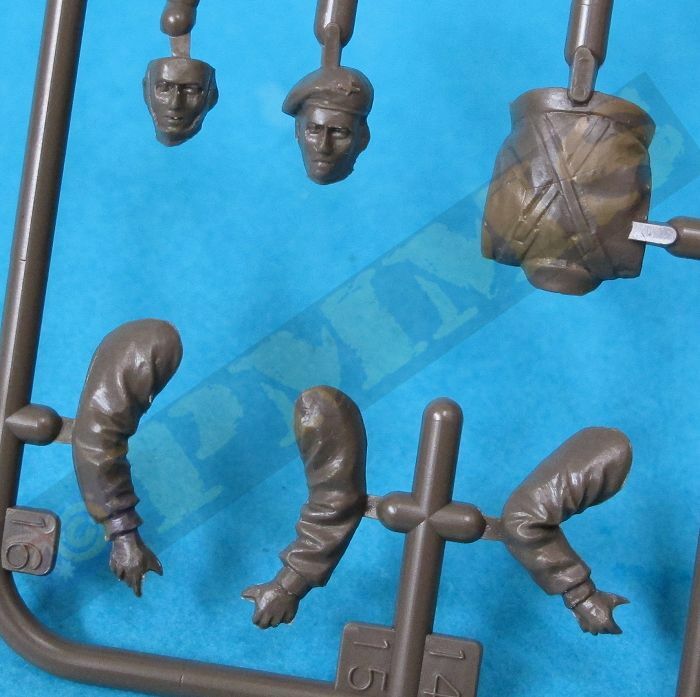 The two Para figures included in the kit are broken down in the usual manner for plastic figures and give you two alternate heads, one with beret and the other steel helmet as well as three arms per figure allowing a different arm poses to be achieved for some variations. 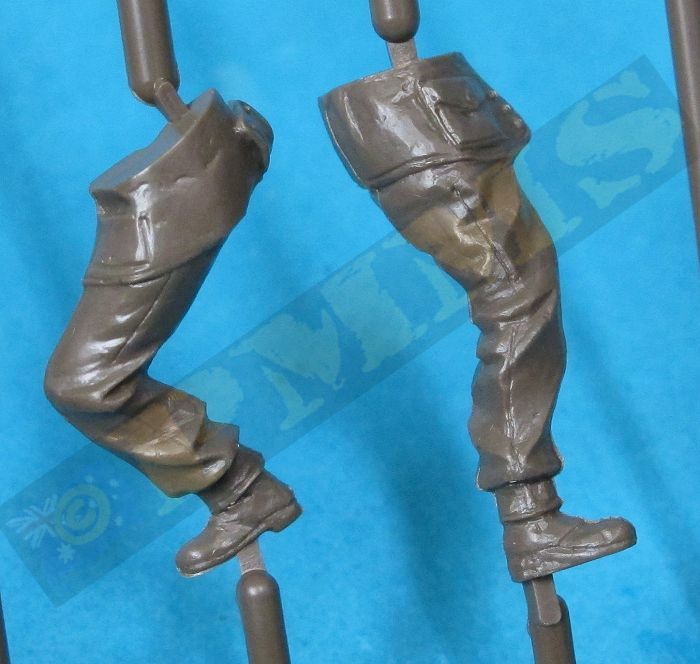 Uniform detail is quite nicely done although the mould lines are quite heavy and need care in removing, the fit of the parts is very good making for simple figure assembly and they should paint up quite respectably. The only issue is one of the figures does seem a little on the big size but I guess body sizes varied although when posed with the undersized bikes makes him look even bigger. The instruction sheet includes a B&W map that can folded and posed in the hand of one of the figures if you wish but being B&W lacks any realism for the purpose. 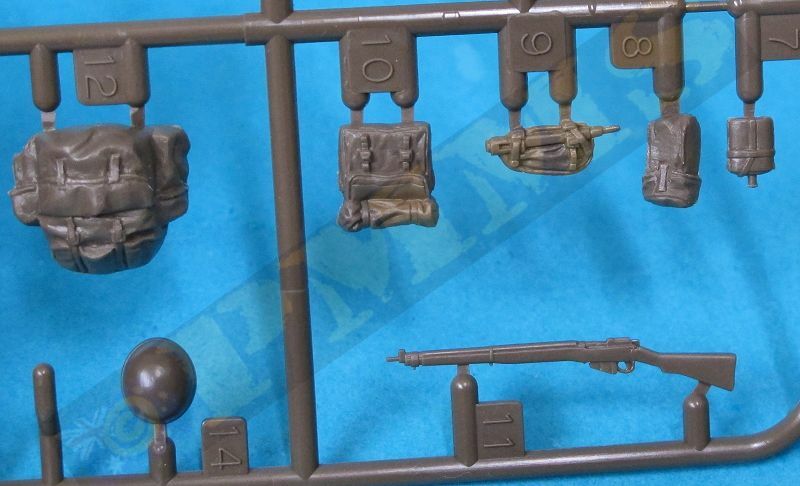 Added equipment is provided for the figures with two Lee Enfield No.4 Mk.1 rifles and a selection of person gear such as ammo pouches, water bottles, entrenching tools and haversacks to use with the figures as required. 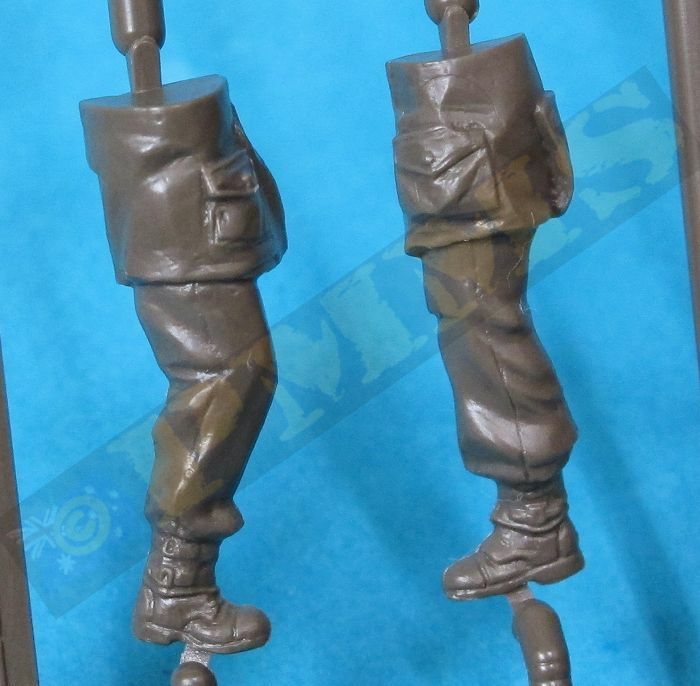 Overall these Airborne Folding Paratroopers Bicycles from Tamiya are quite a disappointment being undersized dimensionally as well as have very basic levels of detail to say the least and are certainly not up the standard of contemporary 2013 kits. The oversized spokes, mostly solid frames along with smooth wheels and lack of other details such as the handlebar brake levers make for a noticeable lack of any real detail definition. 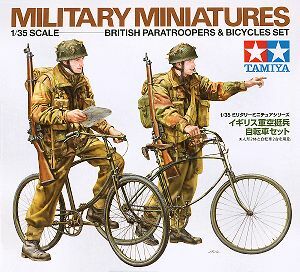 If you want a quick and easy bike build to add some background filler to a diorama I guess these would suffice but as a centrepiece they really are found wanting and if you want a detailed Airborne Folding Paratroopers Bicycle you would be well advised to get the Diopark bicycles instead. Price wise the Tamiya kit goes for about $10.00 while the Diopart kit is around $18.00 but this is very much a case of you get what you pay for. 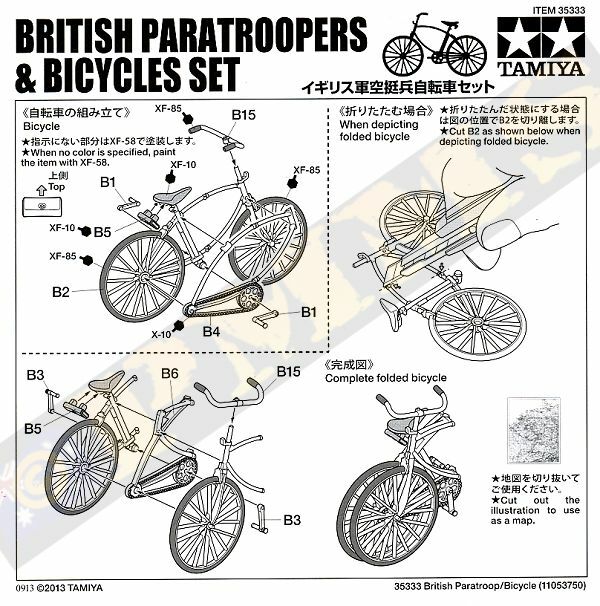 In reality you are paying $10.00 for two Para figures with the Tamiya kit as the bikes have very few redeeming features sadly. Rating: 5.5/10 for the bicycles alone, 7.5/10 including the figures. Thanks to my credit card and for the review Kit.